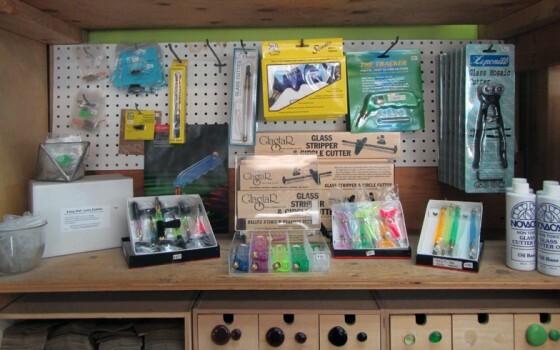 We carry a full selection of glass, supplies, and tools, everything you need to work with stained glass, as well as a few items that are not necessary but sure are nice. 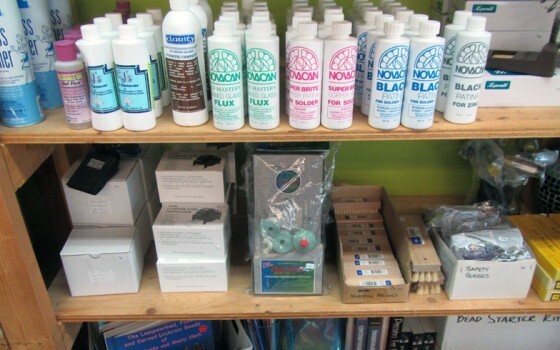 If you’re looking for something specific just give us a call. If we don’t have it, we can try to find it for you. 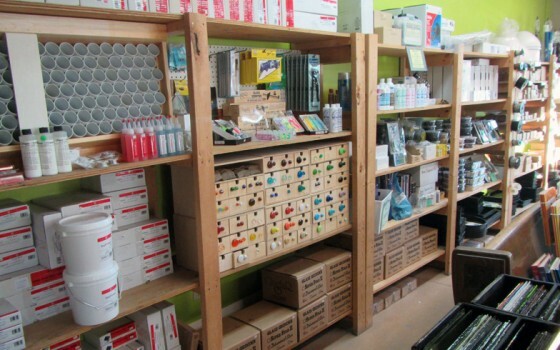 We carry all the chemicals you may need including cutting oil, black and copper patina, wax, flux, flux remover and glass cleaner. For foil our sizes are 3/16″ 7/32″ 1/4″ and even 1/2″ all in black, copper or silver backed. We carry both round and flat lead as well as zinc, copper, and brass framing in many sizes. 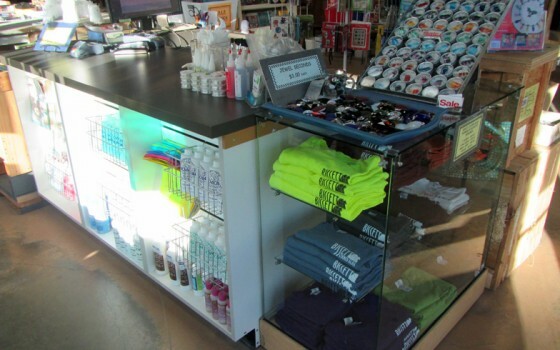 Basically, if you use it, we have it! 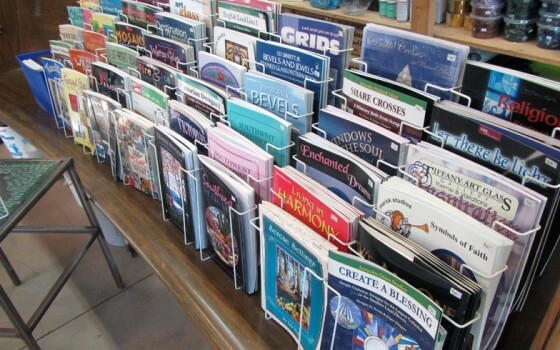 We also carry a full range of stock bevels, coloured bevels, and bevel kits for that extra ‘sparkle’ in your piece, and incase you’ve run out of ideas we have racks and racks of pattern books. 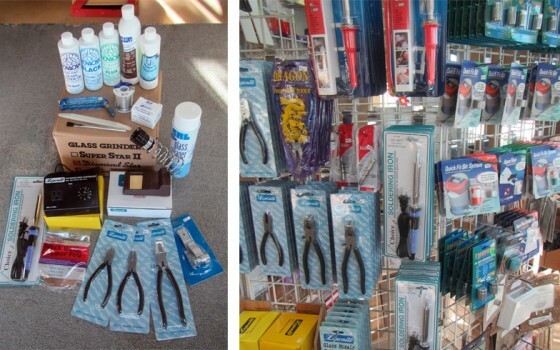 We carry many of the tools you will need including Glass cutters, Mosaic Cutters, Breaking Pliers, Running pliers, Grinders, foiling machines, soldering irons, rheostats, iron stands, lead nippers, lead knives, lead vices… and more! If you’re looking for something new and challenging, check out our selection of Lamp molds and patterns as well as the lamp bases to go with them. The fun never stops. 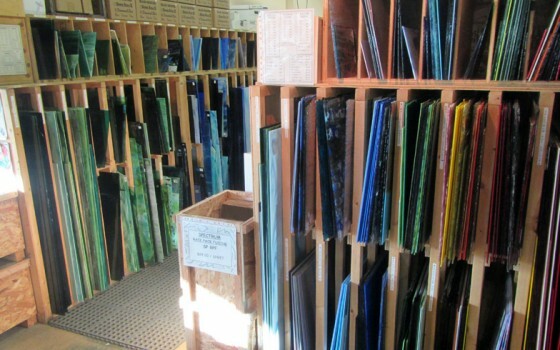 Our glass rack includes a wide selection of Wissmach, Bullseye, Kokomo, and Architectural glasses as well as Urobouros, Youghiogheny, GNA, and even hand blown glass like St-Just. 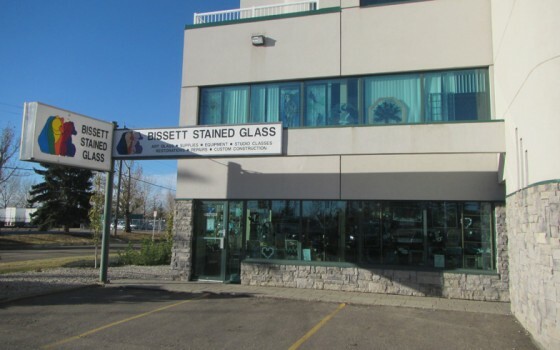 Though we still have Spectrum glass remaining, we will not be carrying it any longer as Spectrum has ceased production. 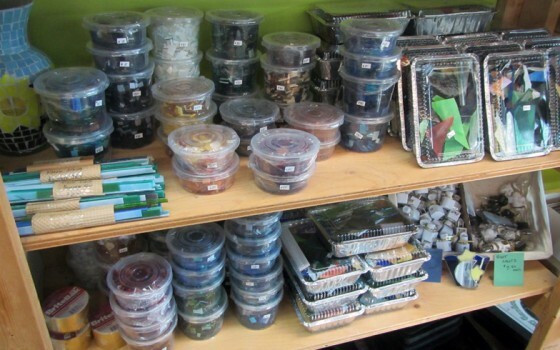 We have containers of mosaic glass in many different colours or choose from our regular stock glass if you’re looking for a more custom look. And for patio stone molds we have various sizes and shapes including squares, triangles, hexes, hearts and more. 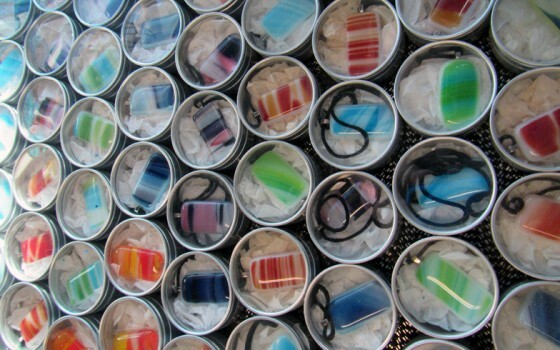 check out our selection of glass, frit, stringers, Dichroic glass, slumping molds, and cut-outs in both COE 90 and 96. 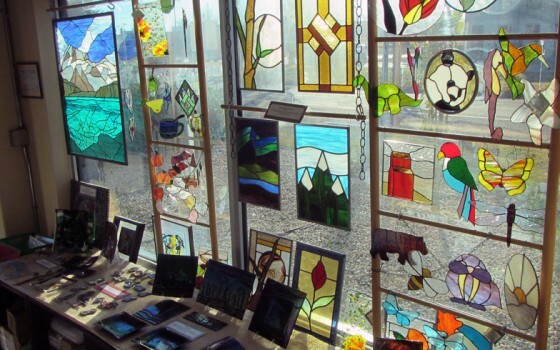 We have an assortment of already-made stained glass pieces, from sun-catchers to panels, from lamps to lanterns, if you’re looking for a gift for yourself or for someone else we have a wide selection to choose from. All of our pieces are handcrafted here at our studio. 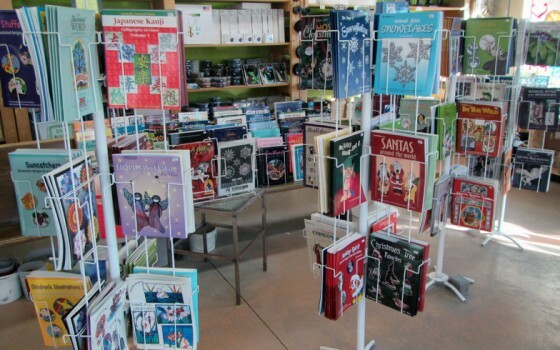 If you’re looking for something specific for that hard-to-please loved one, we can always custom create that special and unique panel for you. 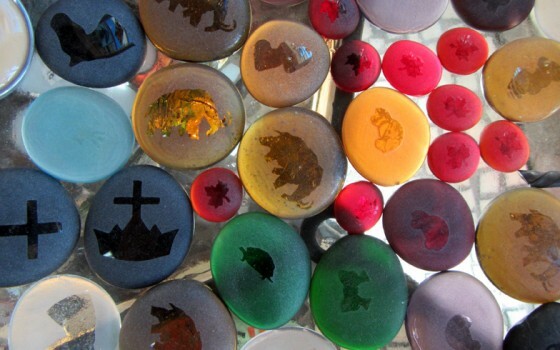 Visit our studio to choose from fused, sandblasted, and stained glass creations. Our staff will help you find it or we will create a very special piece for you.